I was raised in a small country congregation where there was no thought of security. During services, the doors and windows routinely stayed open to allow fresh air to circulate. After services, children played freely on the lawn without a parent in sight. And no one worried about safety. When I became a teenager, my family moved to a much larger congregation. This building featured winding hallways and multiple entrances. It ought to have been a much greater problem for security than my country congregation. Yet every door remained unlocked, and no one ever dreamed of security concerns. However, my adult years have been spent in law enforcement, a career that has trained me to think more seriously about security in everyday life. As someone accustomed to carrying a firearm, I have developed the habit of arming myself whenever I am in public, even at worship. I do not wish to encourage security paranoia, but a physical attack in worship would be emotionally devastating to a congregation. It is, therefore, essential that elders and church leaders become proactive and deliberate in their security plan. Our spiritual security is far more important than our physical security. That being said, the Bible both authorizes and expects God’s people to defend themselves. Scripture teaches in Exodus 22:2, “If the thief is found breaking in, and he is struck so that he dies, there shall be no guilt for his bloodshed” (NKJV). Apparently, even though the thief lost his life, his death was justly taken. Further, elders are charged with protecting the churches they oversee. Paul warned, “Therefore take heed to yourselves and to all the flock, among which the Holy Spirit has made you overseers, to shepherd the church of God which He purchased with His own blood. For I know this, that after my departure savage wolves will come in among you, not sparing the flock” (Acts 20:28-29). While Paul might have been speaking of spiritual enemies, the same equally applies to physical ones. To shepherd the flock is to protect it from physical attack (cf. 1 Samuel 17:34-36; John 10:11). Churches are the perfect target for criminals. The thief knows that every Sunday service features a collection consisting of hundreds or even thousands of dollars in cash. In addition, people carry money and wear expensive jewelry, and most churches do not even consider locking their doors during services. Parking lots too are easy targets, for fine automobiles are parked in well-hidden areas without a human being in sight. Far more serious, however, is the fact that many congregations have children running freely both inside and outside the building with little adult supervision. The unspeakable dangers are obvious to anyone who bothers to consider them. Security in most churches is nonexistent. Just the threat of evil ought to provoke churches to consider basic security measures. I would encourage elders to consult any member who has training in law enforcement or in security services. These men and women have received advanced training in handling major threats and can assist in compiling a security plan for the congregation. If such a member is unavailable, then contact congregations who have already implemented a security plan. Brethren need to assist each other in an effort to secure our worship services. Once a plan is formulated, the elders can then inform deacons or key leaders within the church about the security plan and enlist the help of volunteers to form a security team. 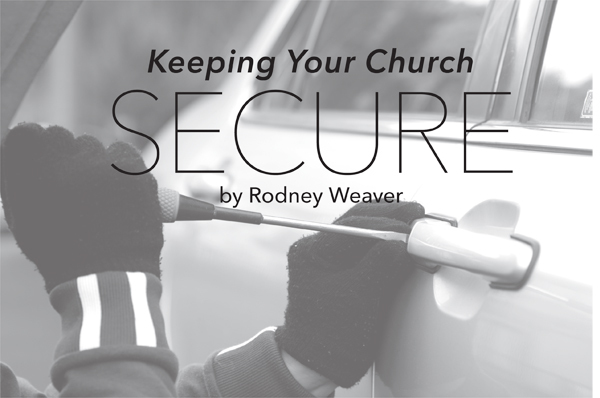 Each church has unique security needs, but here are several general tips all congregations can find helpful. • Lock all exterior doors from the inside. Every exterior door should have the capability of locking from the inside without a key. If a church chooses not to lock the doors during services, it is advisable to have a designated security official close by. In the event of a threat, the door can be locked quickly and without the security official needing to fumble through a set of keys. However, the better plan is to lock the door when services start and to unlock it as soon as they are over. Locking the door is a minor, but important, security measure. • Form a safety team. Many congregations have already taken the step of forming safety teams to sweep the building during and after Bible classes and worship. These teams can also monitor the parking lot and can coordinate with one another in the event of a security threat. For many years congregations have featured ushers to greet visitors. A safety team can serve to greet those who arrive late to worship services and to protect the congregation in the process. • Designate security officials to sit in strategic locations in the worship service. I always attempt to sit in the location that gives me the maximum tactical advantage in the event of an attack. Although it can be difficult or impossible for one person to watch all auditorium entrances, several designated officials can easily monitor even the largest of auditoriums. • Utilize security technology. Security cameras and visual monitors are more affordable than ever, and they have the advantage of keeping people out of harm’s way. If an intruder were to break into the building, security personnel could monitor his position and report immediately to law enforcement. • Exercise common sense. Not every Christian feels comfortable on a security team, and some do not have the training to fill such a role. But all Christians can notify others when something just doesn’t seem right. Please do not become paranoid, thinking that every new face represents a potential threat. But remaining vigilant of potential threats might save lives. If you see something that looks out of place, notify someone who has the training to handle the situation. It seems that the world is more evil today than ever before, or at least we are more aware of the evil around us than ever before. The need for physical security ought to be apparent. But we should not become so enthusiastic for physical security that we forget why the church exists. We must seek and save the lost (Luke 19:10). We must attempt to make disciples of Jesus out of those seeking to know Him (Matthew 28:18). Unfortunately, we no longer live in the “good old days.” We cannot afford to leave the windows and doors of the church building open or to allow our children to play unattended. As the world grows more hostile to Christians, greater security measures will become necessary in order to provide a safe worship environment. With an appropriate plan and a prepared team of dedicated security personnel, our brethren can worship without fear. Rodney Weaver has spent over 20 years in law enforcement and now is the director of security at Freed-Hardeman University. He may be reached by email at rweaver@fhu.edu.